J.W. 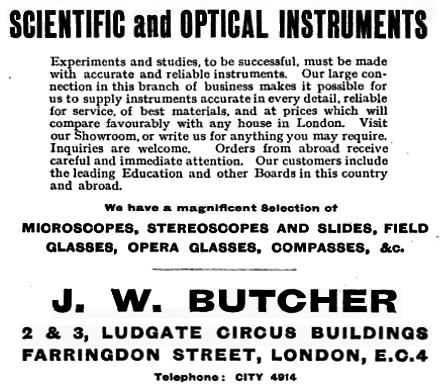 Butcher operated a scientific and optical supply shop in central London between ca. 1910 and 1926. To judge from the number of microscope slides that can be found with his label, he moved a considerable number through his store in those 16 years. He advertised extensively in London college bulletins, which would probably have brought him considerable business. Butcher’s labels appear on a wide variety of slides, both professional and amateur. Some identifiable makers were dead by the time Butcher began his business. If a maker’s name was present on a slide, Butcher covered it over with his label. These suggest that he did not specifically enlist mounters to produce for him, but instead bought up old collections and re-sold slides. 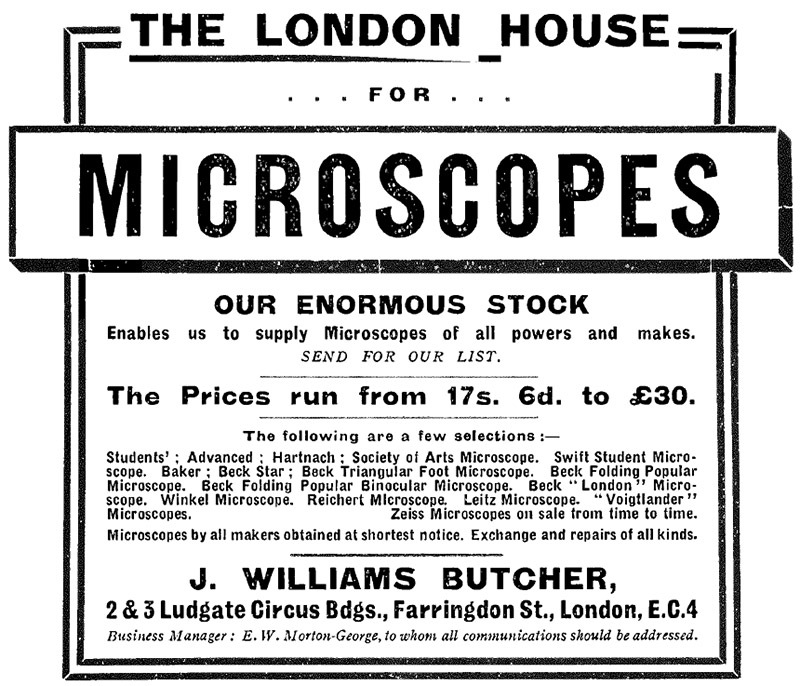 Similarly, his advertisements state that Butcher sold microscopes from many different makers, including obsolete styles such as the Society of Arts (Figure 3). Butcher referred to his business at 2-3 Ludgate Circus Building as the “Slide Gallery”. 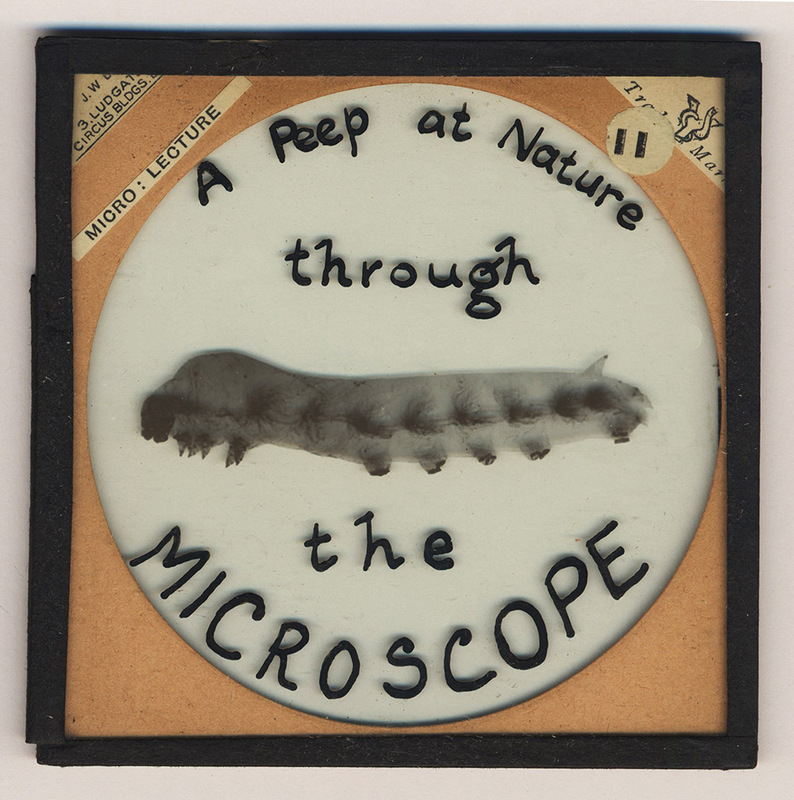 This was almost certainly due to his retailing of magic lantern slides, not microscope slides. In contrast to the microscopy aspect of his business, Butcher probably had many of those lantern slides produced for his shop. 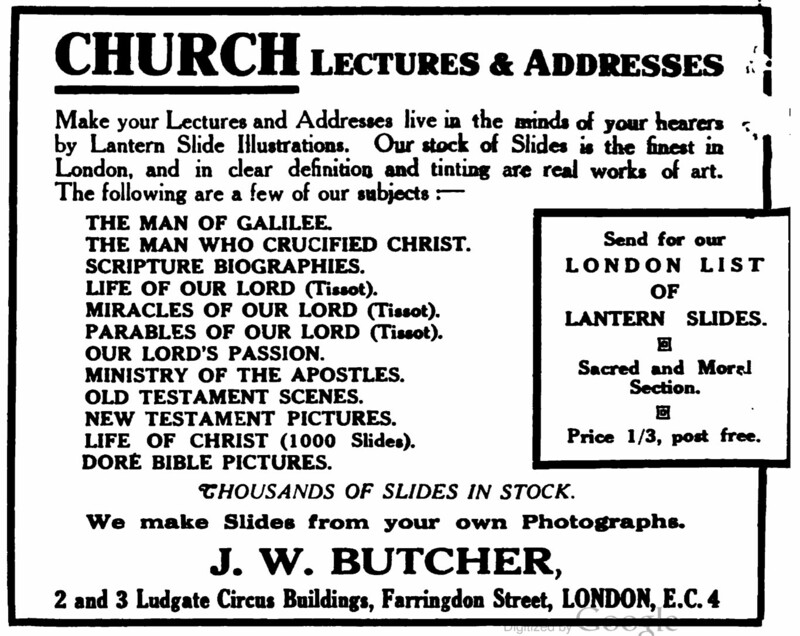 Butcher was an ordained Wesleyan (Methodist) minister, and sold numerous series of lantern slides to accompany sermons (Figure 4). Butcher also wrote a number of books, and published works by other authors, primarily on religious topics. Figure 2. A 1916 advertisement by J.W. Butcher, from the Calendar of the University of London. Figure 3. A 1921 advertisement, from The Bulletin of Entomological Research. Figure 4. A 1922 advertisement from The Church Quarterly Review. James William Butcher was born in Gravesend, Kent, during 1857. He became a Methodist minister in 1881, and subsequently served churches throughout Britain. He ministered in Wavertree, Lancashire in 1891, and in Glasgow during the early 1900s. During 1911, he relocated to London. Advertisements for his Ludgate Circus shop appeared soon afterward. Nothing has been found to explain why Butcher undertook his business venture at that time, and there are no indications that he operated similar businesses during his other posts. From 1907 to 1923, he was Secretary of the Wesleyan Sunday School Department. Butcher published advertisements through at least 1924. A 1926 advertisement lists the proprietor as A.J.G. Seaton “late J.W. Butcher”, indicating a change in ownership (Figure 5). The end of Butcher’s business was probably due to his transfer to a church in Liverpool. He died in that city on February 16, 1837. J.W. Butcher and Company was an accounting firm, owned by John William Butcher, located in the Imperial Buildings, Ludgate Circus. There are no known family connections between the two Messrs. J.W. Butcher – John W. Butcher was originally from Brighton, Sussex. W. Butcher and Sons was a large dealer of photographic supplies and equipment, including magic lanterns. Their “Camera House” was located on Saint Bride Street, adjacent to Ludgate Circus and Farringdon Street. There are no apparent relationships between James W. Butcher and the proprietors, William Butcher, William F. Butcher, and Frank Butcher. Figure 5. A 1926 advertisement, from The Landmark. Figure 6. A 1920 advertisement, from The Bookman. Many thanks to the operators of Lucerna (http://www.slides.uni-trier.de) for providing helpful information on the life of James William Butcher, and to the collectors who provided images of J.W. Butcher’s microscope slides.